As with many of the major tourist towns in Japan, Miyajima has a ropeway that can take you to the top of Mt Misen in the blink of an eye, and without a calorie burnt! 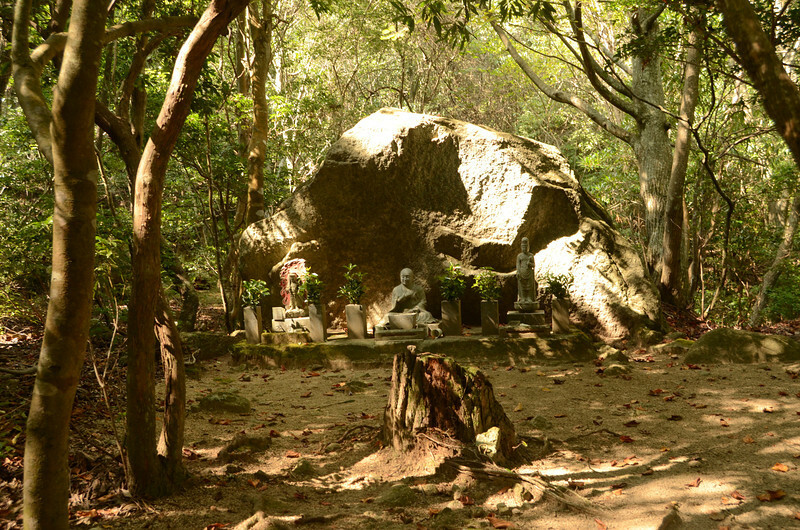 We decided to walk to the top, and to do so we had three options; the Momijidani trail, the Daishoin trail and the Omoto trail. All lead to the top of the mountain but each offer a different perspective on the terrain and the island below. We could only pick two of them (one up, one down) so we decided to go with the Daishoin trail up and the Omoto trail to get back. 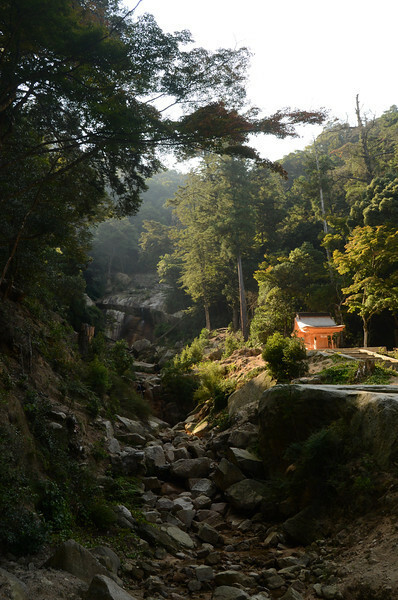 The Daishoin trail takes you up past the Daishoin temple on the outskirts of town, and then climbs steeply up hundreds of granite steps to the top of Mt Misen (500m). Tough on the legs, but we would rather go up them than down! Probably took us a bit over an hour to get to the top in the end. 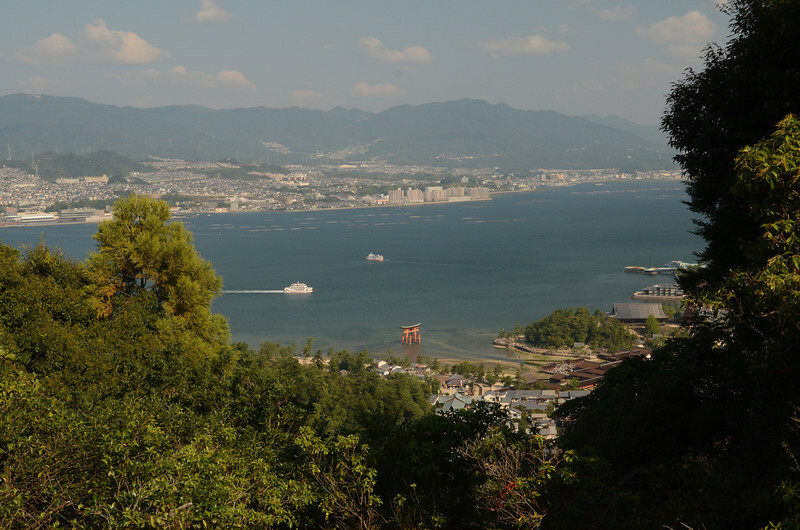 The views from the top of the mountain were great, looking north towards Hiroshima and towards the surrounding islands and peninsulars as well. 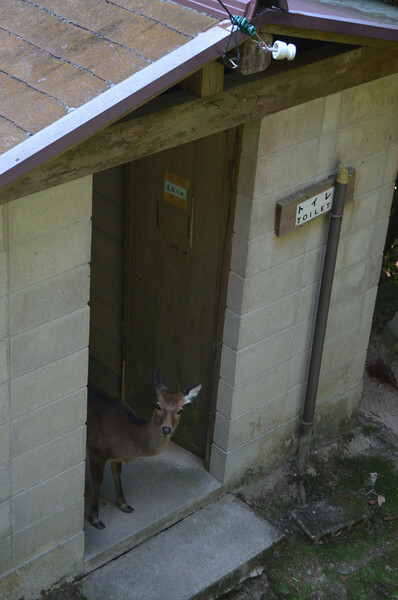 There were a number of shrines/temples at the top of the mountain, as well as a toilet that had been commandeered by a deer (there are literally hundreds of deer on the island, all very tolerant and unafraid of humans). 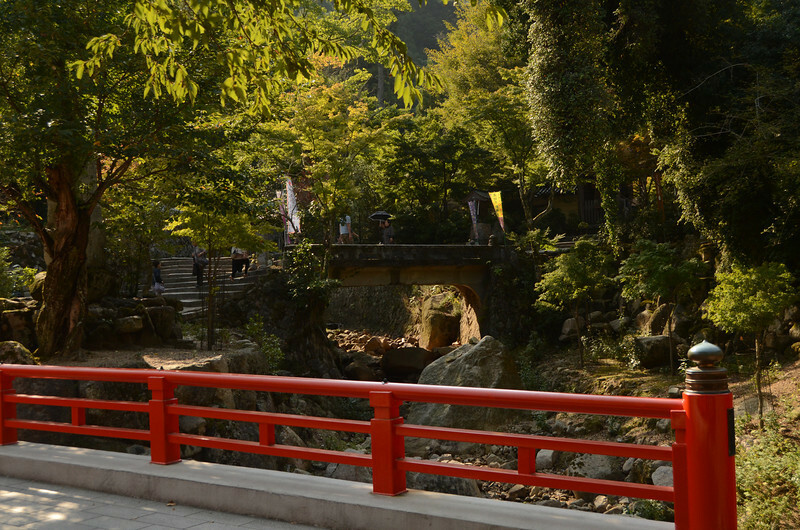 We then took the Omoto path to get back down to Miyajima. This one was a much more natural trail, and although extremely steep on sections, was a lot more interesting as it took is through some fantastic rainforest. After an hour and a half or so we got to the bottom and walked back into town to be greeted by absolute chaos! Being a Sunday, every man, woman, child and pet sausage dog (seriously, we’ve seen heaps of them everywhere we go!) 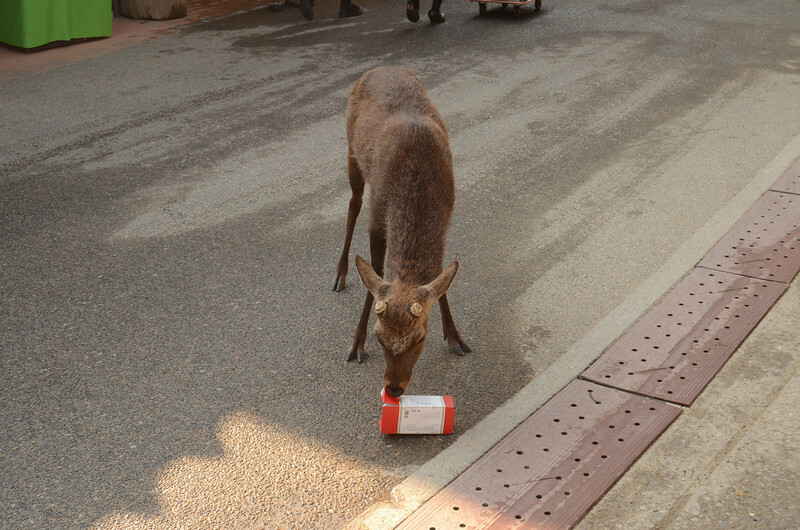 had descended on Miyajima for the day. The streets were packed shoulder to shoulder and lineups for all the decent restaurants extended out into the streets! So we took the easy option and bought some yakitori from a street stall instead. Complete ripoff at 500 yen ($6), but we were hungry! The main shopping street, but from the following day after all the crowds had left. After that we partook in our favourite past time of finding new and delicious cakes and biscuits. Were we in luck! Miyajima is quite renowned throughout Japan for its biscuit called the momiji manju, a waffle/cake-like exterior filled with one of numerous fillings (traditionally bean paste), shaped into a maple leaf. We went looking for some bikes to hire, but they were all taken, so we ended up walking back to our room and having a couple of beers before dinner. They warn the tourists to watch their food, but some just never learn! 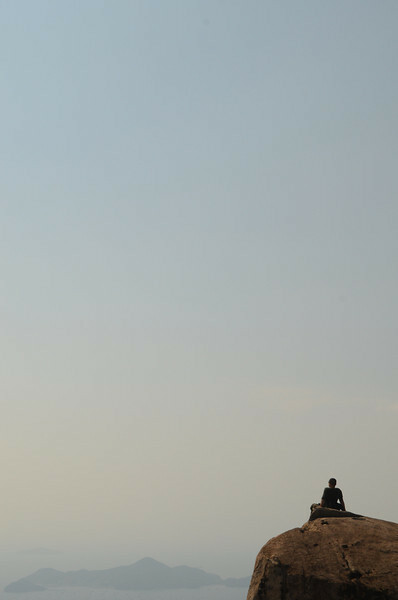 I love your photo of the summit. 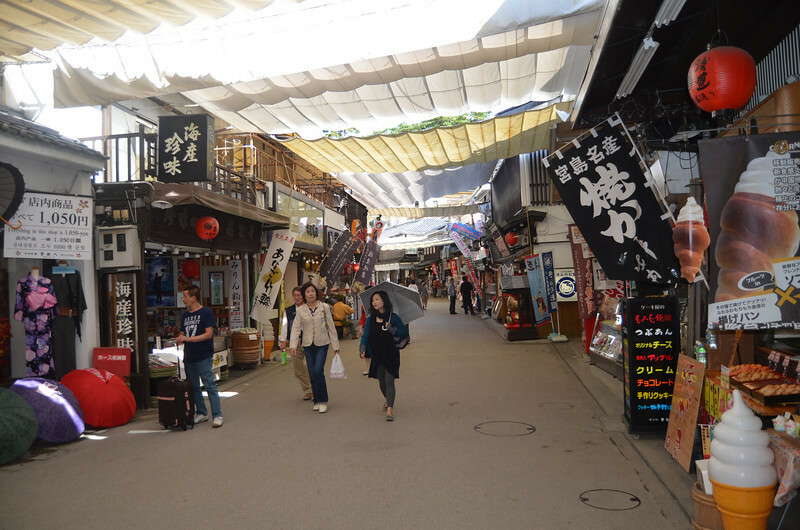 The main shopping street photo didn’t show up though.